Photo Writing - Exploring Photography. : Can the ipad replace a laptop on location? The problem with the iPad is that is doesn't behave like a conventional computer. Apple have, at least to my untutored mind, crippled the functionality of their tablet by forcing the user to import everything through the various iTunes apps. Apparently it is possible to get round this by "jailbreaking" the iPad, but this voids the warranty and can lead to other complications with the actual hardware (although to be fair, those who have done it swear that it is the only way to use the iPad as it opens the tablet up to more user control as well as a host of applications that Apple don't feel should be offered through iTunes). So approaching the iPad as a standalone tool means changing your mindset as to how to move the images around. First, to get those images onto the iPad you are going to need one of Apple's camera kits. This is a small little connection adapter which either reads an SD card directly, or has a USB connection to connect the camera to. There is no CF card reader for the new lightning connector of the iPad 4 (as far as I know), so I had to go with the USB connector and plug the camera directly into the iPad. Trying to plug a card reader into the connector kit does not work as the iPad complains that the device requires too much power. So you have to export the images straight from the camera. The next problem is that the only option you have to import the images with is the actual camera app that comes bundled with the iPad. 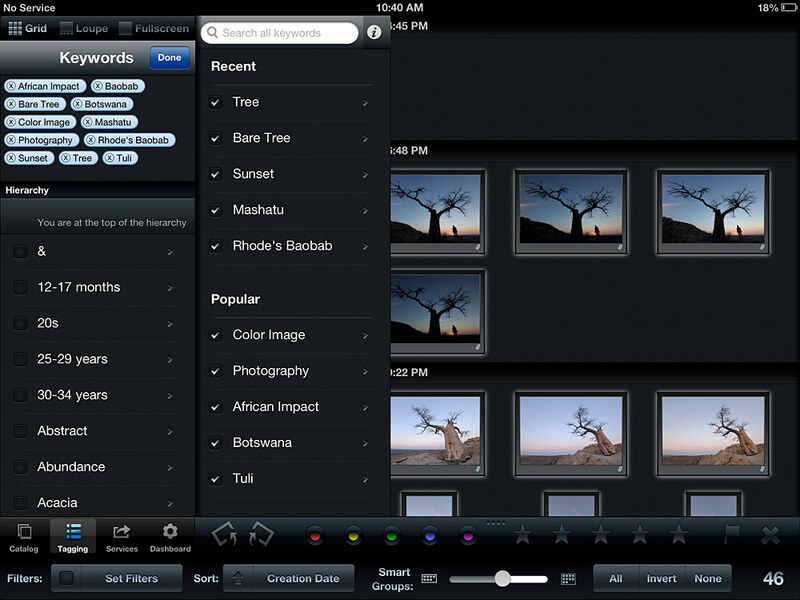 Once the images are on the pad, then you can use third party apps to sort through and work the images. I used Photosmith to sort through and add metadata to the images and Photogene to do some very basic processing of images. In an ideal world, this is what I would like the iPad to do for me: import the files from the card while adding metadata at the same time. Once imported I would like to be able to go through the images, rate, add additional metadata and keywords, cull the duds and sort the images into folders - all from the same app. Photosmith almost does this. The problem is that Photosmith doesn't actually make changes to the metadata of the original image. It adjusts a small sidecar file which is then synced with Lightroom when you move the files from the iPad to the computer. Still, if you use Lightroom as your primary cataloging tool, then Photosmith works really efficiently. For me this is minor sticking point. Lightroom is not my preferred cataloging tool. Personally, I use Photo Mechanic as it allows me to embed metadata changes into the original NEF file rather than into a sidecar xmp file. I also like the way that Photo Mechanic displays the image as shot, unlike Lightroom which puts the RAW file through Adobe's processing as default. So working with Photosmith forces me to reconsider my workflow. Photosmith can be a little buggy from time to time as well. I suspect that this has more to do with the fact that I was asking the app to handle large D3x RAW files (48.5MB) than any deficiencies in the actual software. It did mean that I had to force quit the app a few times if it hung. The worst hanging issues were just after importing images and then again when keywording when the app would suddenly forbid you to type in a new keyword. On that note I found the way that new keywords are created to be a pain. Basically you have to search for a keyword and if it isn't there you have to tap a tick box to include the new keyword. A simple box that allows you type keywords separated by a comma would have been far more logical. Photosmith does give you a good opportunity to sift through images and rate and add metadata, albeit to a sidecar xmp file. Sadly you cannot delete the images directly from the app. You have to do this from the iPad's built in camera app. This is very sad as it means you have to hop between apps if you want to completely delete images. Setting the reject flag on an image in Photosmith means that the image won't be transferred to the computer. This is a good thing, but if you are wanting to use your iPad as a standalone device in the field then you are likely want to delete poor images in order to free up space on the iPad. Space is where the iPad falls short. On the top end models you only get 64 GB of storage space. Call that closer to 45 as you are likely to have other 'stuff' on the pad (I'm aware of the new 128 GB iPads but have yet to see one and haven't even seen them advertised in South Africa yet). This means that the iPad can only really replace the laptop on short trips. There is a solution available in the Seagate Hyperdrive which is a 500 GB wifi hard drive that can be used alone with the iPad. However, this creates other problems again in that Photosmith cannot see those images a they are on the hard drive, not the iPad. To sort through and cull images you have to use the Seagate app. 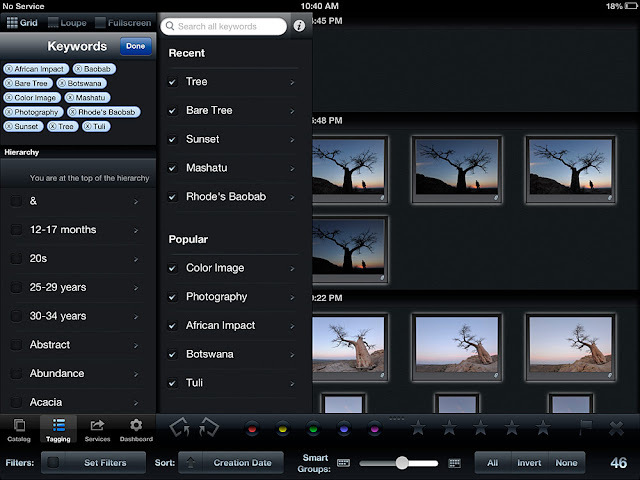 So another app, meaning that you would be bouncing between the iPad camera app, Photosmith and Seagate. This is supposed to simplify, not complicate your life?!?! A last point was that I did some very basic edits to images using Photogene. Again, it's not perfect, but I personally think this is the best little editing app out there. The controls are very easy to understand if you have any experience with conventional editing programs like Aperture, Lightroom or Capture 1. I can't say that the images can be used for anything other than the Internet and email, but it is useful to create small jpegs as a way of sketching processing ideas for later work (I.e. process the an image in Photogene as a rough and then later process fully in your usual editing suite with visual cues from the rough). I've been doing this with one of my regular clients for events and find it is a fantastic way to quickly get a jpeg to them for immediate media release and then continue the laborious task of creating the hi-res finals once back in the studio. What's great is that either myself or my assistant can do this in the vehicle on the way back from a shoot so that the client has an initial few images for media use before we're even back in the studio. Once back home hook up the iPad to the computer and sync Photosmith with Lightroom. Select the images in the collections and move them into the usual folder system that I employ. I have to admit, I haven't made use of the syncing between Lightroom and Photosmith beyond the original import. There is the ability to remove the large files from the iPad and replace htem with small jpegs so that you essentially keep your library with you at all times for keywording and metadata purposes. My concern with this though is the space that would chewed up by this. The iPad's storage is simply not sufficient for me to keep thousands of images in jpeg form AND still use it as a backup storage for RAWs while in the field. For short trips this is a system that seems to work. The iPad's portability really makes it standout as a photographic tool. It means that during downtime you can be catching up on editing workflow that would otherwise chew through valuable time once home. As it is I also wrote the bulk of this post (and the previous post) sitting under a Mashatu Tree while waiting for a pick-up in the middle of the Tuli Block. 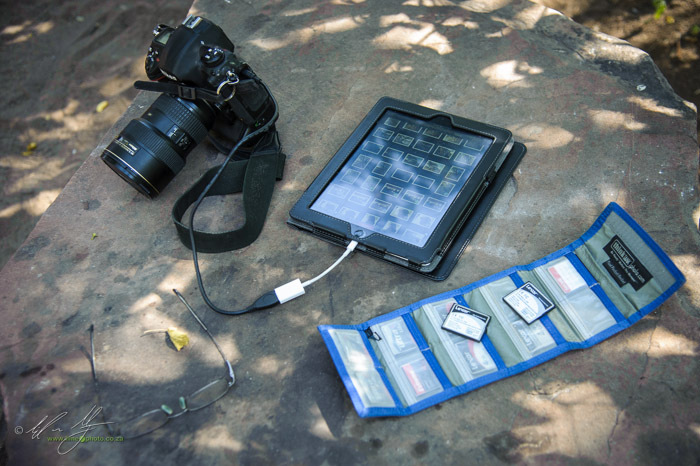 Yes, I could have done this with a laptop, but it's highly unlikely that I would have had the laptop with me in the middle of the bush after a 2-night walking safari in the first place. So yes, the iPad can partly replace the laptop on multiple day photo shoots with a few caveats. It doesn't fully replace a laptop, but I suspect that not that far off in the future it will be able to. So long as my shooting isn't likely to extend beyond 50GB I wouldn't hesitate to leave the laptop at home now. For more serious work though (including anything that requires layered post production and final output quality), it's still a cumbersome and necessity. Import the images through the camera connection kit. Cull obvious duds through the iPads built in photo app. Rate and reject images as well as select 'specials' for working in Photogene. Back at the studio hook up iPad to the computer and import the images via Lightroom, sync Photosmith and sort images into folders based on Photosmith's collections. Continue with usual studio workflow. Things are likely to change in the very near future though. The arrival of Photosmith 3 is imminent. This update apparently allows Photosmith to do some of the heavy-lifting that I wanted Photosmith 2 to do for me...i.e. cull duds and delete them in app. I'll no doubt try it out the second it's released and will write about it once I've had time to play.